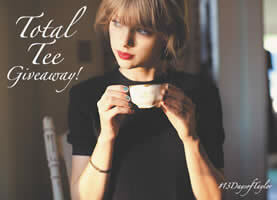 Prize: Each Winner may receive one (1) TAYLOR SWIFT T-shirt. NO PURCHASE NECESSARY. Must be 13+, legally residing in U.S. Three hundred (300) potential winners will be selected randomly. Ends at 11:59 p.m. CST on December 13, 2013. Good luck! !